The impressive artwork demands an impressive display system. 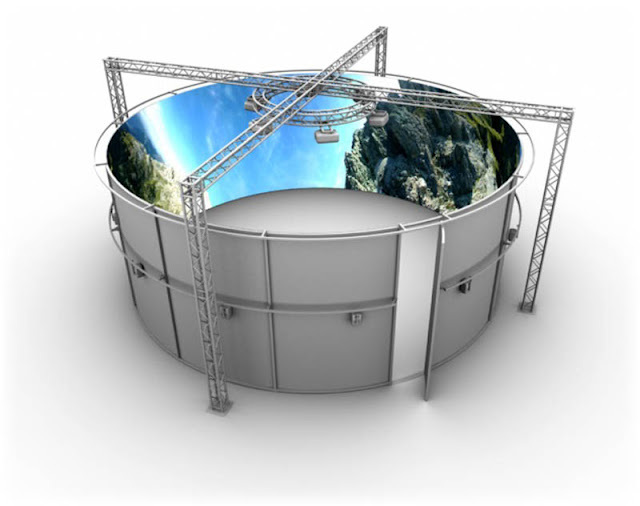 The Advanced Visualisation and Interaction Environment (AVIE), developed at the iCinema Centre of the University of New South Wales, provides just that. AVIE is constructed of a cylindrical screen 10x 4 meters, with 12 projectors and a 13-channel surround sound system, and can immerse an audience of up to 30 people in a single shared virtual environment. Generating real-time visuals for such a large display is computationally demanding. In the past, to render 10K x 1K stereo panoramic imagery at 60 frames per second required a cluster of seven computers. However “clustering” can pose significant problems.